Thirteen large steel sculptures by noted Connecticut artist David Hayes will grace the Northwood Village shopping district of West Palm Beach for a year. Northwood Village, located in northern West Palm Beach, is an oasis of restaurants, galleries and pedestrian friendly shops. The district has enjoyed a resurgence as a foodie destination in recent years, capped now by an exuberant display of outdoor sculpture. The Rickie Report suggests you stop by a little earlier for that dinner reservation, to take in all that Northwood has to offer! Jon Ward, Executive Director of the West Palm Beach Community Redevelopment Agency (CRA), states that “This brings an exciting, world-class display of modern sculpture to one of West Palm Beach’s most charming neighborhood shopping centers.” Northwood Village, located in northern West Palm Beach, is an oasis of restaurants, galleries and pedestrian friendly shops. The district has enjoyed a resurgence as a foodie destination in recent years, capped now by an exuberant display of outdoor sculpture. Son of the sculptor and exhibit curator John Hayes says that the exhibited artwork is part of a traveling museum exhibition and planning for this tour has been going on for over a year. 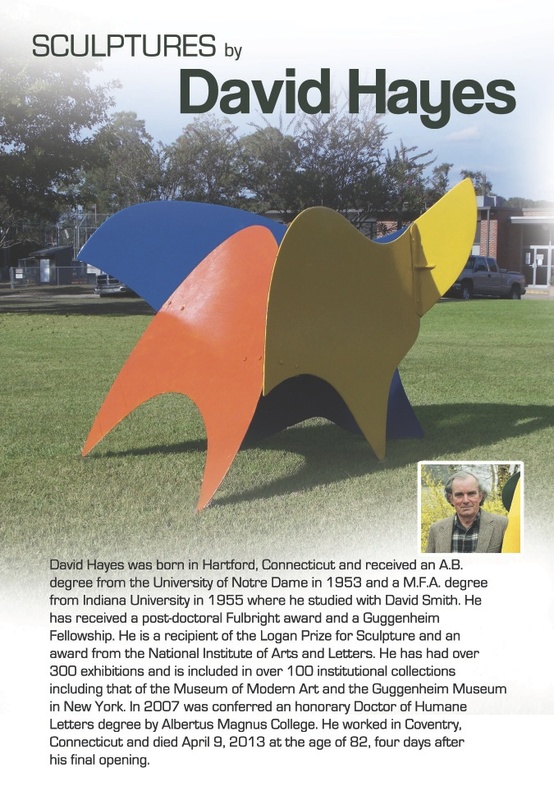 Hayes worked closely with Jon Ward, who previously served on the Board of the Florida Council for Arts and Culture and had spearheaded major outdoor sculpture exhibitions in the region. The sculptures are all created from welded steel plate and are designed for long-term public art exposure. The show consists of a variety of the artists’ different phases, including some screen pieces as well as iconic totems and even one hanging piece. Hayes selected to paint the pieces either in a semi-gloss black finish or bright multi-colors, depending on the feeling of the sculpture. The exhibition enjoys strong support from the community, including the village’s numerous residents and store owners. The late artist enjoyed a six-decade long reputation as one of America’s great contemporary sculptors and has work included in the Museum of Modern Art, the Guggenheim Museum plus over 100 institutional collections across the country. He also designed jewelry for Pierre Cardin while living in Paris. CALL 561-506-4108 To reserve your space! A one & half hour guided walking tour of West Palm Beach’s Center for Art that occurs the second Saturday of each month. Our guides take you into the heart of what has quickly become a vibrant art district offering an eclectic mix of gallery spaces, boutique shops and favorite local restaurants. The tour focuses on the exhibited art within a number of the galleries found throughout Historic Northwood Village. The art includes a generous mix of local, national, and international artist, both emerging and established. While you sip a taste of wine and enjoy appetizers our artists will present demos and lectures on art related topics. This is an opportunity to see the latest in art trends and add to your own collections. Each visit is sure to offer something different and something for everyone. ALL GUIDED TOURS STARTS 6PM SIGN UP EARLY SPACE IS LIMITED TO 16 PEOPLE IF WE RECEIVE MORE THAN 16 PEOPLE WE WILL ADD A SECOND TOUR. Northwood Village is located one mile North of Palm Beach Lakes Blvd., between Broadway and Dixie Highway in West Palm Beach. For more information: visit www.facebook.com/northwoodvillage and www.northwoodvillage.org. Karen Grosser, 561.822.1551 kgrosser@rma.us.com. As ArtPalmBeach/Art Synergy/ARTWEEK 2015 continues, everyone is invited to take part in more FREE, art-related events. This Rickie Report’s focus is on Palm Beach’s Gallery Walk, Northwood Village’s ARTX Walk and Whitespace Collection’s Free admission and special Sunday breakfast. Art IS all around us. Stop, Look, Admire and Support! Be sure to stop by the Palm Beach County Convention Center to see Art Synergy (Booth #718), “This exhibition is an exploration of the aesthetic and scope of work created in South Florida. Twenty selected works will be on display at ArtPalmBeach, which is internationally renowned as the premiere mid-winter contemporary art fair on Florida’s Gold Coast by both art critics and enthusiasts”, explains Rolando Chang Barrero. FREE Trolly service will be provided in some areas, plus UBER is offering an Art Synergy special (see article for details)! The gallery has been custom designed by owner/artist William Halliday to offer the best possible interior exhibition environment for a variety of contemporary art, plus an exciting landscaped sculpture garden and an open air special events and reception area on the second floor terrace. The completely renovated showplace is at the center of renewed activity and energy on the street, exhibiting first class innovative works of art that parallel and exemplify the fresh spirit in this neighborhood. Imagine yourself in a comfortable nook, surfing the web (Free WiFi), holding a business meeting, hanging out with friends, listening to great music (sometimes LIVE), admiring local art, catching some rays on our patio, participating in open mic night, hearing a poetry reading, enjoying a quick cup of joe before or after work and you will understand the draw and excitement of HAROLD’S A COFFEE LOUNGE. Contact OSGS for more information about the newest Mural CALL FOR ARTISTS! Explore an artistic side of Historic Northwood Village Arts District by taking a historic guided gallery walking tour. (The tour is a one & half hour guided walking tour of West Palm Beach’s Historic Northwood Village Arts District that normally occurs only on the second Saturday of each month). Our tour guides will start with a short intro on the history of Northwood Village and will then take you into the heart of what has quickly become a vibrant arts district offering an eclectic mix of gallery spaces, boutique shops and favorite local restaurants. The tour focuses on the exhibited art within a number of the galleries found throughout Historic Northwood Village. The art includes a generous mix of local, national, and international artist, both emerging and established. Meet and greet art, live demonstrations, lectures and more. The Historic Northwood Village Arts District continues the day with Art Walks throughout the day and into the evening which are free VIP guided Art and Gallery tours hosted by the collective ArtX galleries. Celebrate with the award winning restaurants of Northwood Village as they tantalize your taste buds with the “Art of Eating”. Free transportation with trolleys looping the West Palm Beach Art Sunday will travel from White Space Gallery at 2805 N. Australian Ave, to the Historic Northwood Village Arts District located just two miles north of downtown West Palm Beach, West of North Dixie Hwy. in between Northwood Rd. And 25th St, and to Continuum Gallery at 501 Fern Street. There is also *Free parking all day on Sundays in West Palm Beach*. We suggest dining out while you are in Northwood Village. Tantalize your taste buds with the “Art of Eating” Northwood Village style. From breakfast to lunch to dinner you will enjoy dining at its best! Make your restaurants reservations and join the guided tour today! We’re thrilled to partner with Uber to provide new Uber users a free ride (up to $20) to or from Art Synergy! 2) Enter your information in the Uber app and promo code “ARTSYNERGY” when you sign up. 3) Request a ride 5 – 15 minutes before you need one. $20 will be applied towards your first ride on uberX, uberXL, or uberSELECT (not valid on uberTAXI, expires 2/28/15). Questions? Check out uber.com/miami or supportmiami@uber.com. Art Synergy Announces Events During ArtPalmBeach in Nine Districts: Welcome to ARTWEEK 2015! 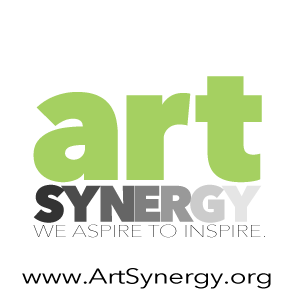 ArtPalmBeach is internationally renowned as the premiere mid-winter contemporary art fair on Florida’s Gold Coast by both art critics and enthusiasts. Celebrating its 18th year, it is Palm Beach County’s longest running fair dedicated to contemporary, emerging, and modern master works of art of the 20th and 21st centuries. Over 85 international galleries will be exhibiting paintings, sculpture, functional and innovative design. Video, new technologies, performance art and art installations have become a unique feature offering collectors exposure to today’s emerging art trends. ArtSynergy: In conjunction with ArtPalmBeach, nine County-wide Art Districts and local cultural institutions will offer exhibitions and events in the surrounding area, creating a unique exciting region wide art week. The Rickie Report is pleased to provide you with the daily highlights. Please note that schedules are subject to change, so consult the appropriate websites provided. Events may take place at the same time in various sites. Don’t miss the special offer from UBER! “Art Synergy’s 2nd Annual Palm Beach Art,” is a juried exhibition of works by professional artists residing in Palm Beach County has been juried by Paul Fisher and Rolando Chang Barrero. “This exhibition is an exploration of the aesthetic and scope of work created in South Florida. Twenty selected works will be on display at ArtPalmBeach, which is internationally renowned as the premiere mid-winter contemporary art fair on Florida’s Gold Coast by both art critics and enthusiasts”, explains Rolando Chang Barrero. At Whitespace Collection Booth #715 International Performance artist, Beatriz Millar will present “Plastic Dorian in Love”. There is limited seating available. Stop by this locally owned “Mom and Pop” Art and Drafting Supplies haven. Open House. Enjoy refreshments at this emporium of artist’s tools and supplies, framing shop, art classes and workshops. Artist Demonstrations will take place throughout the afternoon and include: David McEwen (Internationally Renown Equestrian Artist), Drawing with Craig McInnis, Watercolor with Diane Hutchinson, Oil painting with John D’Auria and Acrylic Painting with Dan Remmel. Have your FREE caricature drawn by Captain Cartoon! 20% discount on non-sale art supplies. Open House at The gallery displays oils paintings, watercolors, acrylic paintings, photography, glass, collage and sculpture. Meet the Artists are working in small studios. In addition, find jewelry, ceramics, and fabric art. Something for everyone! The Brewhouse Gallery is part eclectic hipster lounge, part modern New York art gallery. It’s a creative space to hang out, sip a brew, hold a meeting, share ideas, listens to music, and appreciate local art. Free Wi-Fi and comfortable furniture (that is also for sale) make you feel right at home. Our mission is to support local arts and build community! We serve French Press, Lattes, Cappuccinos, a killer Cuban espresso and other coffee creations made with locally roasted beans sourced directly from the growers. By night we offer craft beer from the finest Florida microbreweries, including Due South, Monk in the Trunk, and Cigar City, along with a selection of favorite wines. Musical performances, poetry readings, painting classes, and other assorted nighttime events keep things lively and we are quickly becoming one of the most well-respected live music venues in all of South Florida. Retrospective of JB Berkow artwork with wine and hors d’oeuvres. Open House with hors d’oeuvres, wine and live music in the Museum and artist demonstrations at the School of Art, including a tour of our ceramics studio. Enjoy Five Exhibitions: “Contempo: Pushing the Limit on Art”, Charlie and Linda Riggs Ceramics, Richard Burkett Ceramics, “En Plein Air” and the Artists’ Guild Gallery. Open House Enjoy refreshments at The Village Art Studios, a charming collection of micro-studios and display space in a co-op setting. The diverse nature of the artwork is due to the quantity and quality of artists from Palm Beach County. Come meet them in their studios! Open House Enjoy refreshments at this working Art Gallery/Art Studio features Original Artist and Artisans displaying and selling their unique pieces. Business Networking Event Hosted by the Armory Art Center at CONTINUUM. Some of the Armory’s teaching artists who are on exhibit will be there to discuss their artwork and promote it to individual and business buyers. Lake Worth Galleries District is home to South Florida’s largest concentration of Fine Art and Craft Galleries in Palm Beach County. Galleries are located along Lucerne and Lake Worth Avenue. Maps will be available . 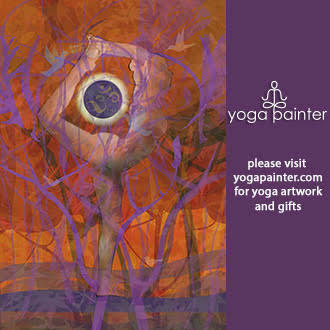 An Art Boutique and Gallery of local, national and internationally acclaimed artists. Shelley Muzylowski and Rik Allen will conduct a fiery display of their glassblowing prowess for your entertainment and edification. Benzaiten’s Creative Director, Rick Eggert, will be narrating the event so each complicated step in the process will be easy to follow and understand. More of this couple’s incredible artwork will be on display in the center’s 1,500 square foot gallery along with works by Rick Eggert and Steve Funk. In addition, there will be a marketplace of artists, local, national and internationally acclaimed. McMow Art Glass and Habatat Galleries are co-hosts. The Cultural Council of Palm Beach County is Sponsor. Other fun features of this event will include a continuous loop of shorts produced by Palm Beach County filmmakers and put together by the Lake Worth Playhouse. Considered the “antique design center” of Florida, West Palm Beach Antique Row is home to over fifty shops & Art Galleries offering an impressive selection of 17th to 20th century antiques, fine Art and decorative arts, period deco and modern furnishings. Architectural Digest, The New York Times, Art & Antiques, and House Beautiful have all heralded Antique Row as one of the east coast’s premier antique shopping districts; a key source for the world’s best interior designers. Contemporary paintings, drawings, sculpture, collage, photography and original graphics. Welcome to our thriving art colony! We have 21 spaces that provide studio and exhibition space to 31 Delray Beach Artists all within one village block. Here you’ll find lots of painting, pottery, sculpture, photography, fashion and works of art. We will be open on Saturday, January 24th, 2015 from noon to 10 pm with a bonfire to follow! Come and meet the artists, explore their studios and discover that perfect something. Two Live Art events: Live Mural Painting by Amanda Johnson, and A. Funk Studio will be open to the Public for throwing demonstrations, and visitors are welcome to try the potters wheel and throw a pot! ARTISTS ALLEY is located in downtown Delray Beach, Florida, three blocks north of Atlantic Avenue and 2 blocks west of Federal Highway/US 1. DIRECTIONS: From Federal Highway/US 1 in Delray Beach, go west on N.E. 4th Street. Cross over the railroad tracks and proceed 80 feet. Turn left onto Artists Alley. The studios and galleries will be on your left in the warehouse bays. Jazz with Samm. View art and enjoy the music.
. The walk will include live art demonstrations, assemblage of sculpture, musical and dance performances, ceramic creations, handmade drums and custom built furniture. Collaboration with Whitespace and Northwood to host a food and art tour of our three locations. Trolley service will be provided, with stops including Clematis Street. CRASH! has been part of numerous museum and gallery shows around the world focusing on Graffiti and Street Art, and has works in many permanent museum collections. Visually iconic, he has partnered with many companies for projects including Absolut Vodka, Fender Guitars, SoBella Handbags, Levi’s, and most recently, Tumi luggage and Morphik. The one day festival showcases a year-long, regionally focused program of events focusing on motion design and interactivity. KeyFrame Motion will present motion graphics work created by talented artists locally and abroad. Contest and all day workshops. Produced by Grapeseekers. For more information about KeyFrame Motion call 561-603-9647 or email info@keyframemotion.com. Brunch and Lecture. Discussion panel with art professionals who service the art community. Closing reception. Artists’ marketplace displaying moderately priced items by CONTINUUM’s Exhibiting artists.